Suggested Tiles are a complement to Mozilla’s “Tiles” features. For instance, regular Firefox users see personalized content called “Enhanced Tiles” when they open a new tab in the browser. This content is personalized based on the user’s browsing history. 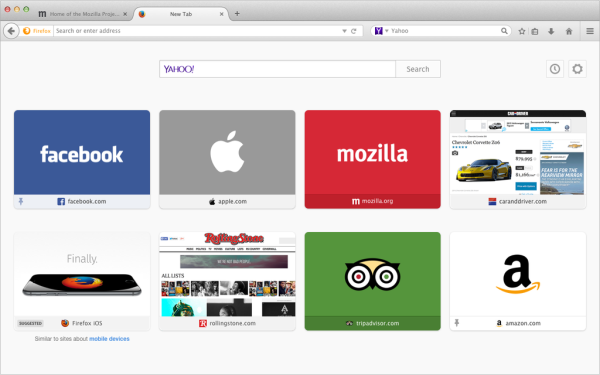 Conversely, new Firefox users see “Directory Tiles” when they open a new tab in the browser. Directory Tiles were launched six months ago and include recommendations on interesting and important content. Suggested Tiles, however, include promoted content based on a user’s recent and most frequent browsing, providing Mozilla with a new way to feature advertisements in the search experience. “Much of today’s digital advertising utilizes data harvested through a user’s browsing habits to target ads. However, many consumers are increasingly weary of how their data is being collected and shared in the advertising ecosystem without transparency and consent – and complex opt-outs or unreadable privacy policies exacerbate this. Many users even block advertisements altogether. This situation is bad for users, bad for advertisers and bad for the Web,” Mozilla states in its announcement. It is important to note that Suggested Tiles will begin Beta soon and are expected to go live this summer, with the rollout beginning in the U.S. Additionally, users will first see “Affiliate Tiles” for other Mozilla causes and Firefox products before Suggested Tiles appear.